It’s always fun to go shopping for Easter dresses for toddlers. Even if your little girl will only wear the dress once or perhaps twice, it will be worth the bother and cost of purchase to see her in it, and see her happy face in the mirror as she sees her dressed up self. Since Easter is the holiday of life, and takes place just when we’re enjoying the first burst of springtime light and color, Easter dresses the young lady should be vibrant, light-colored, or butterfly-like. Let your toddler look like one of the crocuses and daffodils that are springing up in the garden; fresh, sweet, and beautiful. Take your toddler with you dress shopping, and make it a special date for the two of you. It helps if your little girl starts with the assumption you’re just looking and having fun trying on, not buying; then surprise her with a purchase of a special dress once you’ve found the perfect one. If going anyplace—particularly a clothing store—with your little girl is too stressful, you can also order a pretty Easter dress online. 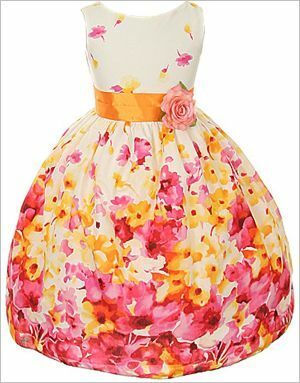 Here are some Easter dresses for your little girl that might just be up your alley. If you’d like your little girl’s skirt to be a riot of colorful blooms one very pretty option is the Kid’s Dream Lavender Flower Print Sash Easter Dress. 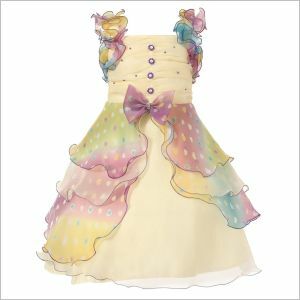 This is a lovely white, pink and yellow sleeveless dress, with a full double-layered skirt that should go down to below your little girl’s knee. The zipper at the back makes it easy to get on your little girl; no wrestling with a tight collar here. The bodice is white with a few small delicate, flowers flying over it, the skirt full of riotous blooms. This dress is 100% cotton, and the sash a pretty satin. You have two color options: fuchsia; bright pink and yellow blooms, or pretty lavender (purple). 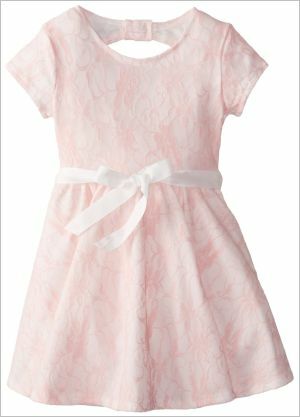 For a simple lace Easter dress have a look at Speechless Little Girls' Bonded Lace Back Loop Detail Dress, a sweet special-occasion pale pink dress with some pretty details, like a back loop detail and a pretty sash. For outright elegance that can make your little daughter look like she just stepped out of a musical—while still remaining perfectly appropriate for your flower-like little daughter in this day and age-- you can hardly go better than with Richie House Little Girls' Dress with Multilayered Pastel Ruffles and Pearls. This sleeveless, long style dress is a beautiful creamy white and features ruffled flowers in rich pastel colors on the shoulders and more sweeping ruffles decorating the skirt. There’s something that goes hand-in-hand with Easter dresses for toddlers: quality pictures of the toddlers wearing them. Here are three tips for taking Easter pictures of your toddler. Don’t take too many pictures at once; a tired, grumpy child never makes for pretty pictures. Let your child see the pictures as you take them, on the display in your digital camera: if she can enjoy them too, she’ll be much more inclined to let you get nice shots of her. Enjoy shopping for Easter dresses for toddlers, and enjoy watching your daughter wear the one you finally select! May you have a blessed Easter.